Jungle Tileset – Free Release! We’ve had huge success over the past two months on Patreon. One of the recent goals was met, and the reward was a new FREE TILESET. The patrons voted for a Jungle theme, and I’m releasing it today! 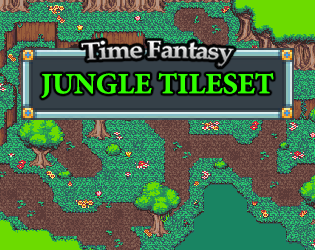 This jungle tileset is a FREE release for anybody to download. This tileset is a mini-expansion for the Time Fantasy RPG assets. It’s compatible with all other graphics that I release in my Time Fantasy style. Can also be used as a standalone tileset. This set includes versions formatted for use in RPGMaker VX/Ace and RPGMaker MV, as well as a regular tile-sheet based on a 16×16 grid. If you want to support my work and contribute to more free releases in the future, check out my Patreon page. I really try to make it worthwhile– I’m no beggar– and always release lots of new content for patrons. Next postFarm and Fort Expansion released! Want to become a pixel artist? Check out my pixel art tutorial series. Artist's home page. Pixel art tutorials and game design articles.